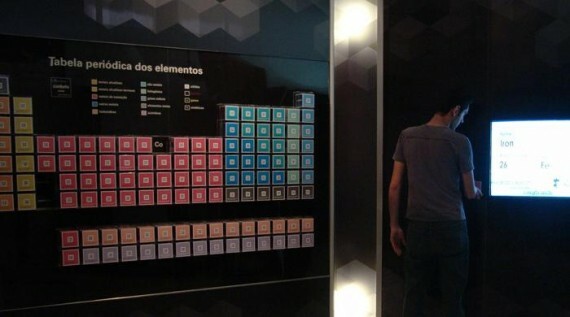 Built to incite curiosity and to change people’s concept of a periodic table, Interaction Cubes brings the elements to life. Using images and videos of each element in experiments and in everyday products, the users can see the elements not only as they imagine them in classroom lectures, but connecting with them. The aim is to bring the elements closer to the user’s lives. For users who have never had contact with the subject, Interaction Cubes provides a playful and pleasant first contact with chemistry and the periodic table. Part of a traveling exhibit, it is built with a modular aluminum structure, reaching public from several states. The Museum of Life is a non-profit public science museum, located in Rio de Janeiro, Brazil. It is based in a neighborhood surrounded by poor communities and favelas. The museum gives an opportunity for students from these communities and from public schools to experience science. The exhibits are mediated by people from the same background and age, who can study and work as mediators. The International Year of Chemistry stimulated the museum to make an interactive exhibition on the subject. Although the resources were few, it was a good occasion to work with a discipline that is often mysterious and misunderstood by students. 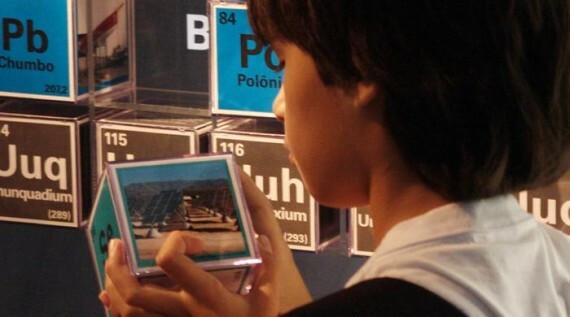 The goal of this particular module was to demystify the elements of the periodic table inciting curiosity on public school students (the museum´s main audience). This project was made, along with the entire exhibition, in 3 months. The museum serves mostly public schools. The exhibition had from two to three class visits (around 40 students) a day (Tuesdays to Saturdays), during 6 months. The main target users were teenagers in chemistry learning level, but the product reached visitors from 8-80 years old. Since the cubes present different information, each user has a unique experience, diving into the information that is most relevant and comprehensible to them. The emotional connection to the product was easily witnessed through young children leaving the museum telling their parents and peers about Molybdenum and Hafnium. Teenagers would post their pictures on social networks, forming their names with the element cubes, and comment that they were formed by Carbon, Argon, Oxygen, etc. The project also gave at least 6 more months of life to previously disposable devices. As a traveling exhibit, it also has the potential to propagate its reach. The exhibition is currently in Boa Vista, Roraima, and has plans to continue its tour around other Brazilian states. The content can also be adapted to other contexts, presenting different subjects, with minor modifications in its configuration. The module was built from old devices that were destined to the garbage: an old webcam, an old tube TV and an old computer. The old tube TV was used as a strategy to provide resolution to a video that would be pixelated on a modern full HD TV. The opportunity was seized by creating a different use for a simple technology such as a QR code, directing the link to local files containing the videos. This simple technology is ideal in attracting the target users, teenagers from public schools, who have the impression that these cubes are magically setting off the videos. Using layers of information, the users can adapt their experience to their interests, knowledge and time. The module, made with light and resistant material (aluminum) can be easily disassembled and transported to other museums and exhibits around the country. A printable version was also created to allow a quick and easy reproduction of the module, which can be used with any computer associated to a webcam. This was especially useful on our “mobile science” truck project. It travels to small cities around Brazil and sets up a 3-4 day exhibit in adapted spaces.